Work and Pensions department’s assessment released before key Commons debate as welfare bill passed by majority of 56 – Britain’s poorest households will be hit hardest by government plans to limit rises in working-age benefits to 1% in a bid to save £3.1bn by 2016. This Tory attack on the poorest should come as no surprise. Neil Kinnock could just as well have been speaking in 2010 instead of 1983. 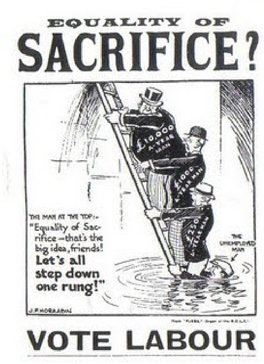 Seumas Milne writes: “As the depression-era cartoonist highlighted, the idea that there can be any equivalence in belt-tightening for rich and poor is a nonsense. Even if the different income groups were paying proportionate shares, or the wealthy were actually shouldering a heavier burden, as Osborne claimed, the impact would obviously be far greater for those struggling on benefits than for beneficiaries of the boardroom bonanza. 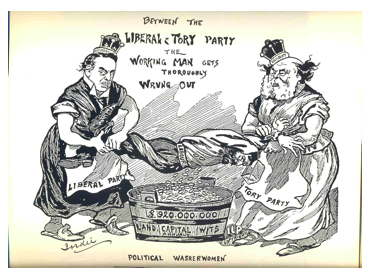 That pre-war cartoonist was JF Horrabin and his image was first used on a poster by the Labour Party during the 1929 general election and, later, by PLEBS, an organisation connected to the National Labour College. ” I warn you. I warn you that you will have pain – when healing and relief depend upon payment. I warn you that you will have ignorance – when talents are untended and wits are wasted, when learning is a privilege and not a right. I warn you that you will have poverty – when pensions slip and benefits are whittled away by a government that won’t pay in an economy that can’t pay. I warn you that you will be cold – when fuel charges are used as a tax system that the rich don’t notice and the poor can’t afford. ………. I warn you not to be ordinary. I warn you not to be young. I warn you not to fall ill. I warn you not to get old.